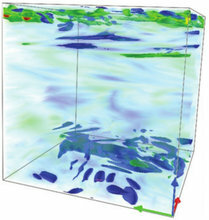 We investigate the large-scale intermittency of vertical velocity and temperature, and the mixing properties of stably stratified turbulent flows using both Lagrangian and Eulerian fields from direct numerical simulations of the Boussinesq equations with periodic boundary conditions, in a parameter space relevant for the atmosphere and the oceans. Over a range of Froude numbers of geophysical interest $(\approx 0.05 $—$ 0.3)$ we observe very large fluctuations of the vertical components of the velocity and the potential temperature, localized in space and time, with a sharp transition leading to non-Gaussian wings of the probability distribution functions. This behavior is captured by a simple model representing the competition between gravity waves on a fast time scale and nonlinear steepening on a slower time scale. The existence of a resonant regime characterized by enhanced large-scale intermittency, as understood within the framework of the proposed model, is then linked to the emergence of structures in the velocity and potential temperature fields, localized overturning and mixing. Finally, in the same regime we observe a linear scaling of the mixing efficiency with the Froude number and an increase of its value of roughly one order of magnitude.